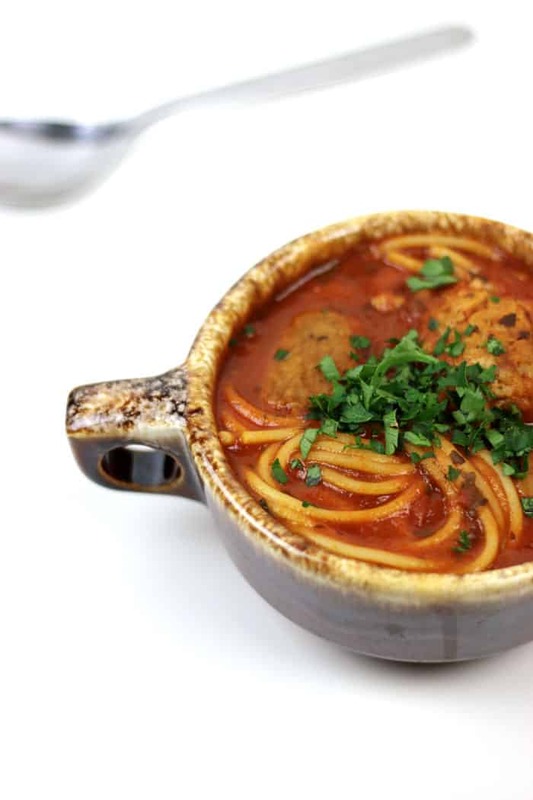 Turn homemade chicken meatballs, pasta and tomato sauce into a hearty bowl of Tuscan goodness. 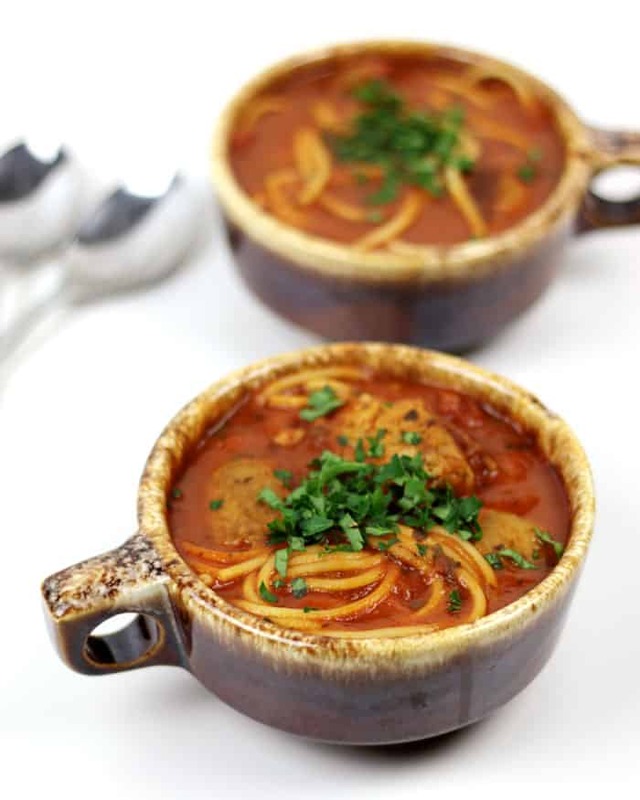 Spaghetti and Chicken Meatballs Soup is the answer to busy weeknights! The last few weeks have been busy — to say the least. I don’t just mean ‘regular busy,’ the kind people say they are when everything’s just normal. This was what I call ‘ultra busy,’ I’ve been juggling the end of a big project, moving to a new place and starting a new full-time job. Yeah, this woman is ready for a weekend! Busy weeks like this mean that it can be a struggle to get dinner on the table. It’s easy for me to want to pick up take-out, but I’d rather cook if I can make the time. Plus it helps me wind down. 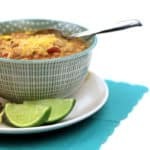 I always opt for quick meals, maybe a slow cooker dinner or something I can throw together in less than 3o minutes. Even reheating leftovers or turning them into something new. Good storage containers are hard to come by, but they do make a huge difference. I recently tried out the new Rubbermaid® Brilliance™ premium storage containers to store leftover cooked pasta and meatballs. One of our favorites for a busy night is cooking up a big pot of pasta and meatballs that will last for a few meals. 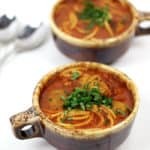 Add to the leftovers a little chicken broth and give them some more time on the stove, and we’ve got a totally new dish: Spaghetti and Chicken Meatballs Soup. I stored the rest in the fridge for one more meal. 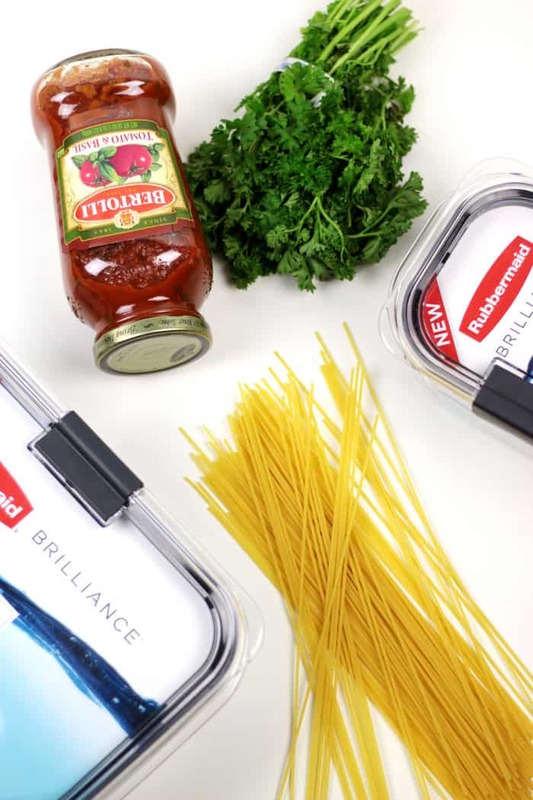 Rubbermaid® Brilliance™ is a new innovation at Walmart. 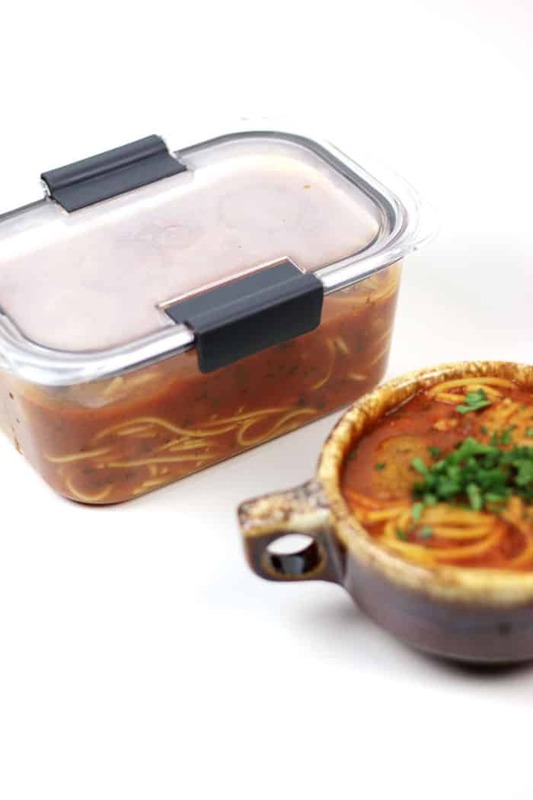 Launched in October 2016, these storage containers make an excellent addition to the kitchen. I love that they are 100% leak-proof guaranteed, microwave safe and splatter-proof! Plus, they stack! Anything that saves space in my fridge is automatically my favorite. I also love that these storage containers are stain resistant! 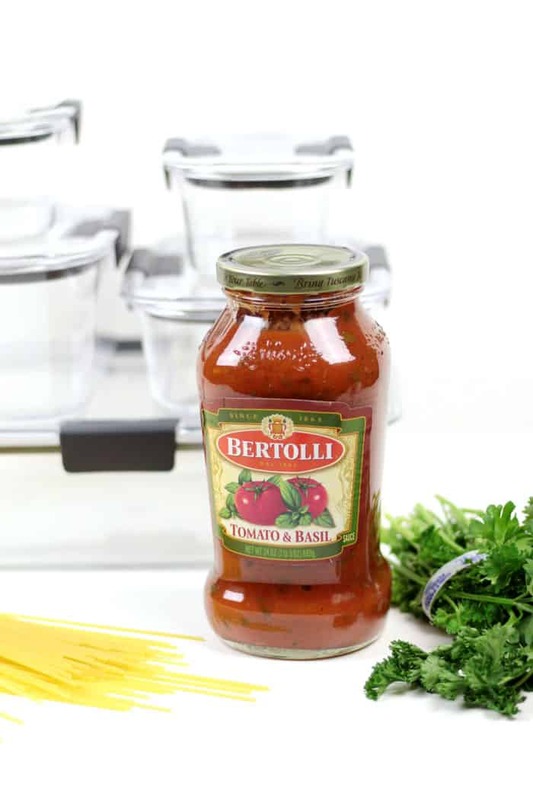 When I cook pasta, I often turn to Bertolli® Sauces like the Tomato/Basil or the Creamy Basil Alfredo, and the tomatoes won’t stain these containers! Amazing. 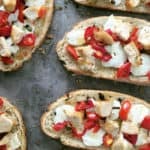 In a large bowl, combine first six ingredients. Stir to combine. 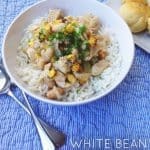 Form tablespoons of chicken into balls with your hands. Add olive oil to a large skillet over medium heat. Add meatballs. Cook 6-8 minutes, stirring often, until meatballs are golden brown on all sides. Remove from heat. Make the soup. In a large pot over medium heat, bring chicken broth to a boil. Stir in tomato sauce and water. Bring to a simmer. Add cooked spaghetti and meatballs. Cook 6-8 minutes. 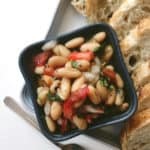 Garnish with fresh parsley and serve. Girl… you need to come to Denver and cook me comfort food all winter long… This soup looks AMAZING. Oh I love everything about this post! 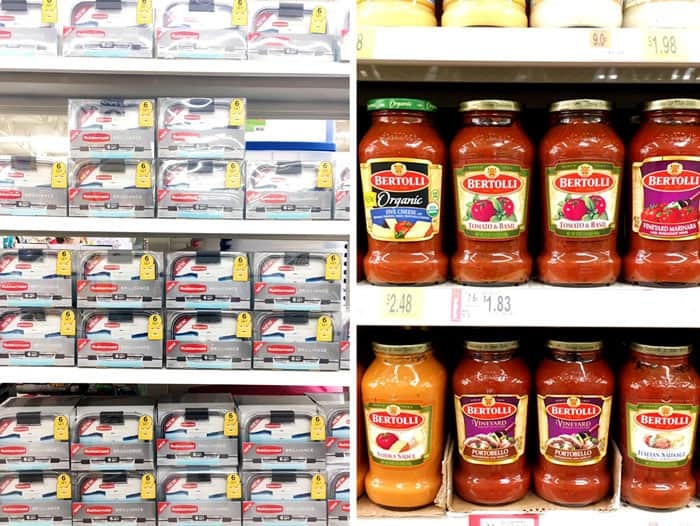 Rubbermaid containers are my BFF and pasta…how can I say no to that? 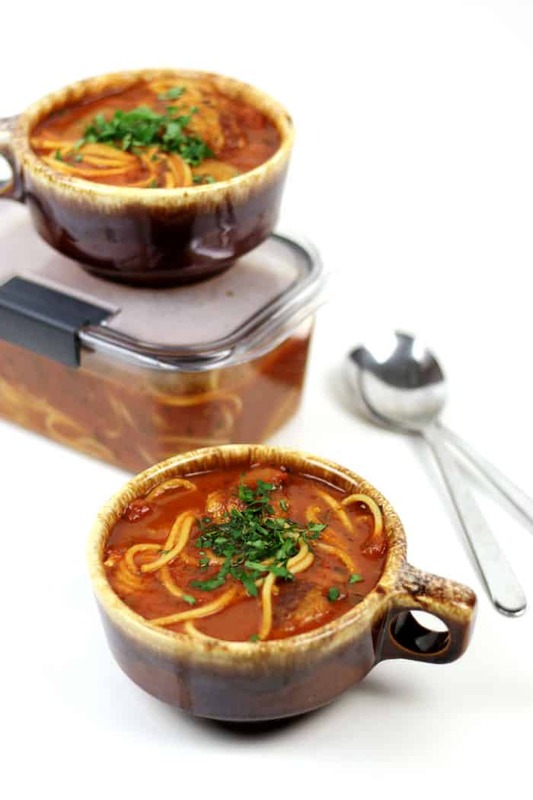 Here’s to the weekend and to an awesome soup like this that we can indulge in! Well done!